The beauty is that what might otherwise have been an indication of frustrating controls, a poorly placed difficulty spike, or plain old bad design, was actually a testament to how well the game is made. I was not mad at the game, I was mad at myself. The controls are intuitive, responsive, and just the right amount of forgiving, essential for a platform title like this. The design of the levels is interesting and challenging. I knew exactly what I was supposed to do. The game wasn't failing me, I was failing me. It was a challenge, and no, there was no way I was going to accept the suggestion and walk away. Dammit, I was going to finish the level! This is actual an experience you don't get presented with all that often anymore. It's almost endearingly old school. In an age where games bend, twist and contort to make sure you can progress smoothly through the experience they offer, it is refreshing to play a game where you know that nothing is standing between you and mastering any given level. Here there are no dodgy camera angles or awkward 3D to interfere with the experience, neither are there any frustratingly evil pixel perfect jumps to perform. The levels are simply wonderfully designed to test the skills the game has given you as you progress. Here I knew it was all on me. The game was not at fault. The game for it's part was succeeding in a way few games do these days. Dammit, I was going to finish the damned level! ...even if the game was ever so slightly unwittingly taunting me for my lack of reflexes! 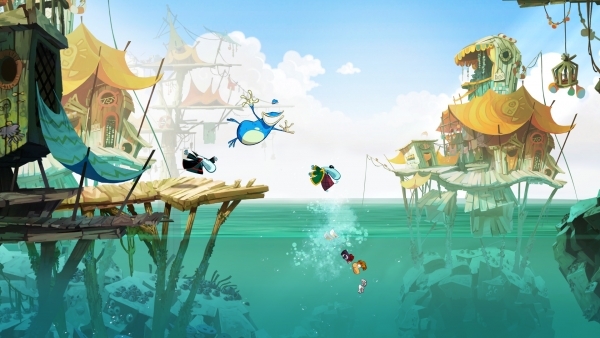 Rayman: Origins fits the Vita platform perfectly. Hopefully it might even find a home on Sony's new handheld that compensates for the fact that the game buying public seem to have shunned the other versions somewhat. Myself included. It is probably unlikely, with the backlog of great games to get through, that I would have thought to pick up an old fashioned 2D platform game like this for my PS3. On the Vita however I was immediately drawn to it. Maybe it is the memories imprinted upon me by the Gameboy and previous handhelds, but there is just something inherently fitting about the format. The side scrolling shooter sections are also wonderfully nostalgic. While nowhere near as challenging as the platforming sections, they provide a nice break from proceedings, and fit just fine with the nature of the game. The game has a gorgeous visual style, with the series' trademark zany characters present and correct, and just as in it's big brother on the larger consoles, the art style feels right at home with the 2D setting. This is a game not trying too hard to be the poster child for Sony's new plaything. It is doesn't sacrifice substance for style, while actually being one of the most charming and stylish early efforts on the platform. It isn't trying to flex those new rendering muscles, or show you what the Vita hardware is capable of. It is however a great example of showing off how great art and game-play design can combine to ably demonstrate how much fun the Vita is capable of. Real, honest, old fashioned, fun. Refreshing. I can't escape the feeling that platform games were never meant to go 3D and that there will always a place for an experience like this in my heart. Playing through brought back all kinds of memories, in particular evoking what I remember games like Earthworm Jim to have been like, with the pure gameplay appeal of the original Mario games. Cliche or not, they just don't make them like this anymore. If you miss an old school sense of fun and challenge, this is an almost essential purchase. I hope there is always a place in our gaming hearts for some pure side-scrolling platform goodness.